This past Tuesday, grassroots groups around the country took part in a national day to remember 1986. 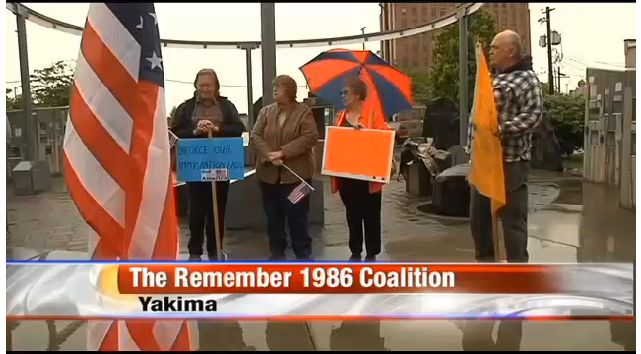 At least 50 separate organizations banded together under the banner "Remember 1986 Coalition." With a unified voice they asked Senators, the press, and fellow Americans to remember the broken promises of the 1986 amnesty bill and warned to not let it happen again. In thirty-four states, from New York to Washington, organized press conferences took place. 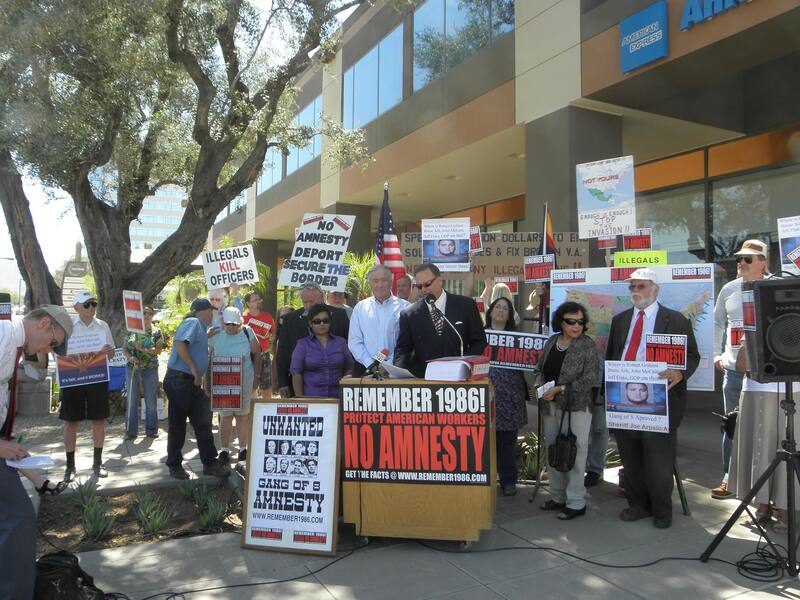 Many NumbersUSA activists took part in the press conferences talking about the major flaws in the Gang of 8's amnesty bill. Others attended meetings with Senate staffers and delivered our Say No to Amnesty petition signatures to Senate offices. Below are some stories and pictures we received from the events. We want to thank each and everyone who took part in the event. The type of activism described in the stories below will be the reason we defeat S 744. I managed to get myself stationed with my 4' x 4' "Amnesty is Treason - Keep Immigration Safe, Legal, and Rare" sign in front of the Salinas Post Office at exactly ten o'clock. I enjoyed an hour of delightful banter with the people coming and going in front of the post office. Sure enough, two officers of the California Highway Patrol showed up, but after they satisfied themselves that I was perfectly compliant with all the legal provisions associated with public demonstrations on county property, we all had a laugh about how much fun law enforcement could be, when the only show was yours truly. Their presence added a great deal of interest to the event, and pretty soon several of my friends who work at the post office came out to cheer me on, and more and more people stopped to just share their views on S. 744. I assured the CHP officers that I thought that revolution and leading a citizens revolt were just not my thing, mostly because being revolting doesn't pay worth beans. We waved at each other as they rode off to less enjoyable duties, and I folded up my operation at eleven. I can truthfully say it was a lot of fun, and I'm looking for more opportunities to let the whole world know how phony, disingenuous and sold out Sam Farr and his big ag buddies are. Heading home, we came upon a Border Control car. We all drove by giving the driver a thumbs up. He's trying to do his job. Now it will be up to our elected representatives. Are they up to the task? We got the petitions delivered to Nelson and Rubio's offices today and spent about 45 minutes at each office. The staff were very polite at both offices. Rubio's office manager claimed not to have heard of NumbersUSA. We found that hard to believe. Also, he said that "the House isn't going to pass this bill." I found that interesting. We held a small rally on the street in Indianapolis and passed out flyers including yours. We delivered the 7,000 anti-Amnesty petition signatures to Senators Coats and Donnelly’s offices. We had an hour-long meeting with each of their legislative assistants and were respectfully received. Both assistants were non-committal about where their bosses stood on S.744 because they were "still reviewing it. We met with Adele Griffin in Rubio's office. Only Adele was present and the phones kept interrupting us. Ms. Griffin listened but was not buying the reasons I had stated about the problems with S. 744 nor the unfulfilled promises from 1986. I quoted the polls showing Rubio's slide since S 744 was released to the public both among highly conservative, somewhat conservative and Hispanics. In handing over the unboxed 480 pages of names, I emphasized the 19,000 signatures were of Floridians. I gave her a printout of the 4 Big Problems analysis by NumbersUSA. Roan Garcia and his group Americans Have Had Enough held a press conference with two State Representatives from South Carolina. Reps. Tom Corbin and Mike Burns have both introduced resolutions opposing the Gang of 8’s bill and proposing their own measures on how to fix our immigration system including a secure border and mandatory E-Verify. Their event got coverage, while the pro-amnesty protesters were left screaming at the walls outside of the State Capitol. Watch the news clip on their press conference here! Silvia and I met and then we walked into McCaskill's office. We then went 10 minutes by car to Blunt's. We described what we had showed them the 176 pages and asked for confirmation once the senators received the documents. I told them it was from NumbersUSA and I handed them my personal card. The citizens ofNew York and New Jersey join in a nation-wide coalition of citizen lobbyist and border control organizations on this day in calling on Congress to solve the illegal immigration crisis that has plagued the U.S. for decades. Watch this entire press conference here! The petitions were successfully delivered! We had a couple TV crews and a couple of print sources. It was not a slow news day though. Besides the tornado, we were upstaged by Jodi Arias doing a live feed from the courthouse at 9:30am. We also had the occupy anarchists folks stop me cold during my speech, and it went downhill from there. Police were involved. We finally made a human circle so that our speakers could say what they came to say. I spent 30 minutes with Sen. Baldwin's aide and gave him the petition, poll and "4 Big Problems"material. I said if Baldwin supports this amnesty I would like an explanation from her defending her decision to throw 22 million jobless Americans under the bus. 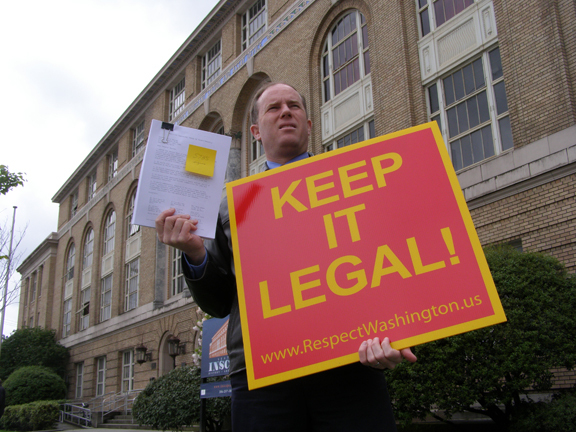 Albert, Josh and I visited Sen. Murray and Sen. Cantwell offices inside to delivery the NumbersUSA petition. I have asked for official written response from each senator to be sent to me. Once received I will than forward responses to NumbersUSA. The Cantwell aide was particularly impressed with the great number of Washington State signers (5800). It was a good day! At least rain did not dampen our activity. Despite the cold and rain, a small group huddled in Yakima’s Millennium Plaza on Tuesday morning as part of a series of nationwide protests against a U.S. Senate proposal for immigration reform. The “Remember 1986” rallies are an attempt by opponents of a path to citizenship for undocumented immigrants to show the shortcomings of the 1986 Immigration Control and Reform Act, local organizer Bob West said. West said the 1986 immigration bill, like the current one, promised and then failed to provide increased border security, which should be the priority. Read this entire article from the Yakima Herald Republic here. And watch the clip of the press conference from KNDO station here. Thank you once again to everyone who participated! If your group has feedback or pictures you would like to be included on this blog, please send them to NumbersUSA.